Ever feel like Hearthstone could do with a few more volatile inventions and diabolical machines? All manner of such mad science and more awaits in The Boomsday Project, the newest Hearthstone expansion. It’s bringing 135 new cards when it launches next month on August 7. Dr. Boom, the infamously powerful Legendary minion from 2014's Goblins vs Gnomes set, serves as the face of the expansion, which pulls its lore from the Netherstorm region first introduced in World of Warcraft: The Burning Crusade. 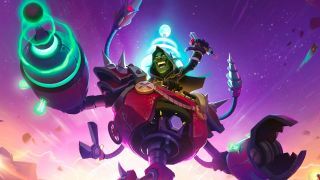 Promising gizmos and gadgets galore, The Boomsday Project's biggest features include the first-ever Legendary spells, single-player brain-scratchers in The Puzzle Lab, and a new Mech-based keyword called Magnetic. Coming off the back of the spooky theming and somewhat stale meta of The Witchwood expansion, The Boomsday Project looks like it'll mix things up in some fascinating and strategy-warping ways, with cards that facilitate unconventional win conditions and peculiar plans of attack. You can see all the cards revealed thus far in the gallery below, but the ones that really stick out to me are the Legendary Rogue spell, Myra's Unstable Element, and the Druid spell Biology Project. Myra's Unstable Element is the kind of quirky ability that initially seems bad, where you draw your whole deck and instantly go into fatigue - but with the right combination of cards (like, say, Dollmaster Dorian), it could create a power combo finisher that would catch any opponent by surprise. The Project cards give each class a spell that theoretically benefits both players, but when used correctly will likely give you the bigger payout. Biology Project fits with Druid's theme of ramping up mana crystals quickly, and the 1-cost, gain 2 mana effect could lead to some explosive Turn 1 openings. Ramping up mana also plays into the Omega cards, which gain bonuses like better stats when played while you're at 10 mana crystals. Consider the Omega Defender, a decent taunt minion for 4 mana that turns into a 12/6 mechanized monstrosity if you hold it back or draw it in the late game. Though they've been few and far between compared to other minion types in recent expansions, Mech minions will be back in a big way for The Boomsday Project, bolstered by the introduction of the Magnetic keyword. If two Magnetic minions, such as the Hunter card Spider Bomb, are on the board, they'll meld into one, combining their stats and keywords (not unlike Deathstalker Rexxar's Build-A-Beast ability). This could ostensibly be repeated multiple times to create a gigantic Mech of death, provided you're not afraid of Hex or Polymorph. On the single-player side of things, we're getting a mode I'd been hoping to see in Hearthstone for a long time: solo puzzles that test your problem-solving skills and card knowledge to overcome a tricky gamestate. Boom Labs has recruited you as a lowly intern to solve 100 conundrums in The Puzzle Lab, which will be added on August 21 after the expansion launches. We've seen four varieties of puzzle so far, including Lethal puzzles were you have to kill your opponent that turn, and Survive puzzles that make you find the out in a seemingly hopeless situation. We only know the other two types by name so far, but they seem self-explanatory: Mirror (which would likely mean a mirror board between you and the opponent), and Board Clear (where you'd have to ensure that all minions die by the end of your turn). Though I very much enjoyed Kobolds & Catacomb's Dungeon Run and The Witchwood's Monster Hunt modes, The Puzzle Lab sounds like an ingenious change of pace, and I'm stoked to see just how complicated these brain-teasers can get. The Boomsday Project also brings a new Warlock hero into the mix: Mecha Jaraxxus, a half-demon, half-machine villain who would make Cyber-Akuma proud. As with all the latest Hearthstone expansions, you'll be able to pre-order packs before The Boomsday Project launches, then log in to claim free goodies shortly after the set's debut. A bundle of 50 packs, a free golden Legendary, and a Mecha Jaraxxus card back will be sold for $49.99 - or if you want to go all-in, you can get 80 packs, the free golden Legendary, the Mecha Jaraxxus card back, and the Mecha Jaraxxus Warlock hero himself in a $79.99 bundle. You can bet I'll be there ready to craft all kinds of oddball decks when The Boomsday Project hits Hearthstone's PC and mobile versions on August 7. If you're thinking about competing on Hearthstone's ladder, read my cautionary tale about chasing Hearthstone's Legend rank.